The United Nations Environmental Program (UNEP), the Haitian and Norwegian Governments, the Earth Institute, and a consortium of NGOs have launched "The Cote Sud (South Coast) Initiative to rehabilitate degraded land on Haiti's southern claw. The initiative will include reforestation, erosion control, fisheries management, mangrove rehabilitation, and sustainable tourism. If successful, UNEP and partners hope to expand into other regions. 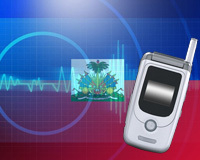 A press release follows and additional information is available at the Haiti Regeneration website. The second annual International Congress of the Haitian Diaspora will take place August 6-9, 2009 at Trump International Beach Resorts in Miami Beach, Florida. The purpose of the event is to capitalize on the resources that the Diaspora can bring to help build Haiti’s economy. The agenda includes a variety of issues such as boosting tourism, stimulating agricultural production, restoring forests and ecology, managing water supplies, preparing for disasters, achieving literacy, and job creation. A schedule of events is copied below. If you would like to participate, you can register here. Contact information is listed below if you want to volunteer.